Below are Box Office Collection Report of bollywood film 'Shubh Mangal Savdhan' With his review, budget and total box office and worldwide collection status. Shubh Mangal Savdhan movie lead star cast is Ayushmann Khurrana, Bhumi Pednekar. Shubh Mangal Savdhan is an indian Comedy, Romance Film of 2017, directed by R.S. Prasanna & produced by Aanand L Rai, Krishika Lulla. Shubh Mangal Savdhan film Released in over 1650 screens in India and 250 screens in overseas. Shubh Mangal Savdhan, starring Ayushmann Khurrana and Bhumi Pednekar is a remake of 2013 Tamil movie Kalyana Samayal Sadham. It is touching a topic less spoken about erectile dysfunction, and doing well at the box office. 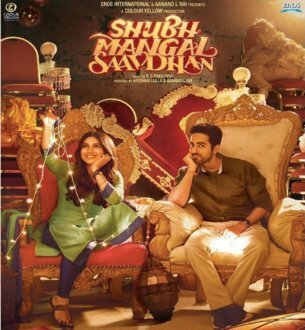 Storyline: 'Shubh Mangal Saavdhan' is a remake of the Tamil film 'Kalyana Samayal Saadham' made in 2013. The story revolves around Mudit Sharma (Ayushmann Khurrana) and Sugandha (Bhumi Pednekar) who fall in love and plan to get married. But the twist in the tale comes when the groom discovers that he suffers from erectile dysfunction.